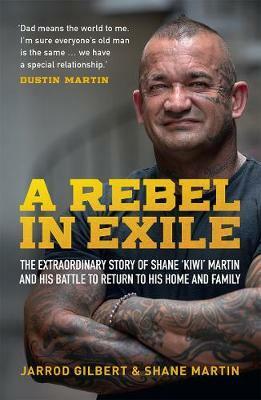 In this revealing book Shane `Kiwi' Martin details his tough childhood and upbringing in small town New Zealand, his decision to 'cross the ditch' and how he eventually joined one of Australia's notorious bikie gangs, the Rebels. He also tells the story of how he came to live, work, marry and raise children in Australia before being controversially thrown out of the country by the Australian government. In early 2017 Shane was deported from Australia and told never to return; a decision he has been fighting ever since. Shane is married to an Australian and his children were born in Australia (one of them, notably, is AFL superstar Dustin Martin) and Shane has lived and worked in Australia since he was 20 years old. Co-writer and previous author of bestselling books on bikie gangs, Jarrod Gilbert helps Shane tell his story - taking us into Shane's private life and behind the scenes of his time with the Rebels, and exploring his battle with the Australian government and its brutal tactics to expel New Zealanders, breaking up families. This is a fascinating story that will appeal broadly giving insights into Shane's fight to return to Australia, his tough childhood and his love for his family. Shane 'Kiwi' Martin is the New Zealand born father of Richmond footballer, Dustin Martin. But he is also one of the New Zealanders no longer allowed to reside in Australia, his home since he was 20 years old. His story takes us inside his tough early life; to his move to Australia; his Australian wife and his beloved Australian born kids; his run-ins with authority; and the bikie club that he loves. Jarrod Gilbert is a writer, author, researcher and academic who writes regularly for the New Zealand Herald, has won a number of media and publishing awards and has also written the bestselling book, Patched, about bikie clubs. He is especially interested in justice and the public good.